Celebrate the union of two family names with their coat-of-arms, making one perfect gift for weddings, anniversaries or any special occasion. 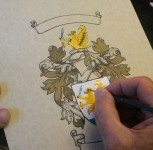 Premium parchment paper becomes the perfect canvas for your past, present and future, as the authentic coat-of-arms for your family surnames is painted by hand in vibrant enamels. This parchment is unframed, so you can create your own custom look. Other retailers (who shall remain unnamed) market low-resolution computer printouts destined to fade, and attempt to pass them off as authentic artwork. We ONLY provide genuine hand-painted artwork, and our unframed hand-painted parchment is the most affordable way to get the real deal. 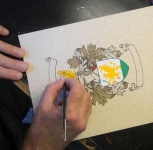 Simply provide the family surnames at check out (and country of origin, if known), and each family coat-of-arms is carefully researched, then hand-painted by a master artist with durable oil-based enamels for vibrant color and lasting finish. Family surnames are painted by hand on the top scroll, while the family motto or country of origin is added to the base scroll, displayed side-by-side for a lasting union of names. Is this for a wedding or anniversary? You can request the date to be featured, and we’ll hand-paint it on the scroll between the shields, commemorating the joining of names, all at no additional cost.